It doesn't matter too much, because the uses are common to all three species. I just need to decide now what to do with the nettle patch, I'm not sure I really want it to stay in the middle of my garden, especially if it happens to be the Greater Nettle, which spreads like mint! For the Greater Nettle, you can propagate by root division, but the others are propagated by seeds (and I haven't seen mine flower yet). Apparently it is very hardy, so it will be interesting to see how it survives our summer, or a harsh winter (we only had a mild winter this year). I would ideally plant it in a patch where its safe to spread, or in a container. The small sting that I received was not painful, but apparently it can be awful, so I wouldn't want to be accidentally walking past it regularly. This is a great post about harvesting and preparing nettle leaves, I will be working with gloves and tongs because I'm a wuss. I intend to remove all the nettle plants and move some of them to a more suitable area, and dry the rest of them to be used for tea and possibly some of the other suggestions below. 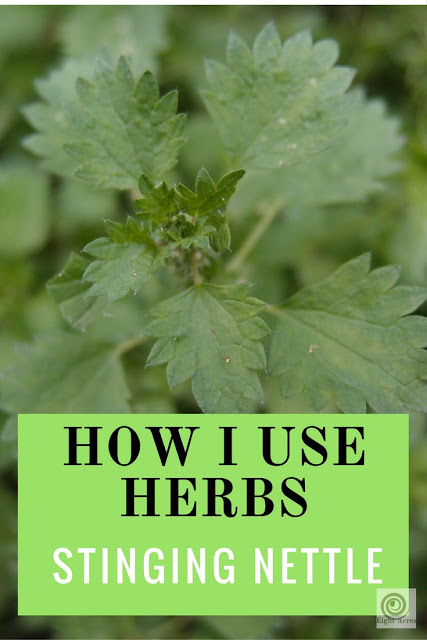 Pain relief - this sounds crazy, but nettle stings stimulate blood flow and many people have found relief from pain (a less extreme option is to put nettle leaves in your bath), and they are used to increase circulation. Eaten or taken as a tea, nettles have anti-inflammatory, detoxification and antioxidant properties. It is also rich in vitamins and minerals. The leaves or the roots can be used in shampoo to stimulate circulation in the scalp - for dandruff and hair loss. Nettle leaves can be eaten like any green leafy vege - steamed, added to soups, smoothies - the leaves don't sting when they are heated, blended or dried. Older leaves are high in calcium oxalate (like spinach and silverbeet). Nettles are a really useful herb, but one that needs to be controlled carefully in the garden. Do you grow and use nettles? Any tips? Liz, I wear really thick gloves to harvest the nettle and also protective clothing as they can really sting badly. I have dried then infused some of mine in olive oil and used that in soap along with nettle tea which I added the lye to. It came out really green but did fade a little over the weeks it took to cure. It was a nice soap though. Nettles go mental in my garden. I do make soup from them (for us) as well as a compost tea for the garden. I've also made cordage in the past on bushcraft weekends that I've done.a good plant but one I could do with a whole lot less of! We don't have any in our garden, but they grow in the bush where my kids have riding therapy. I've contemplated harvesting them before, but they already think we're crazy lol my main experience with nettles was drinking buckets of the tea in latter pregnancy with raspberry leaf. Raspberry leaf as a uterine tonic and the nettle as its really high in vitamin K which was beneficial for me in terms of blood clotting. I had "retained" placentas with all three ( retained by the fact it took a while and one they thought needed removal...but had already detached....was just in no rush to come out ) and my blood loss was minimal. I'd love to try nettle soup one day! Hi from Canada, I use the nettles to make a compost tea, also dry leaves for tea throughout the winter. I recommend you transplant it ASAP and put it into a planter where you can control it. I'm so glad that people are catching onto the value of nettles. We use them in so many ways. Fresh in juices and smooothies, would you believe some people think they're going to sting as we drink them..lol Also dry lots of them every year, to make tea, mixed with mint, is very palatable. also use the dried leaves mixed into the cow's chaff feed while milking. We make nettle ferment for feeding the plants, foliar spray to promote growth, plus into the soil. An old saying, where nettles grow the soil is good.